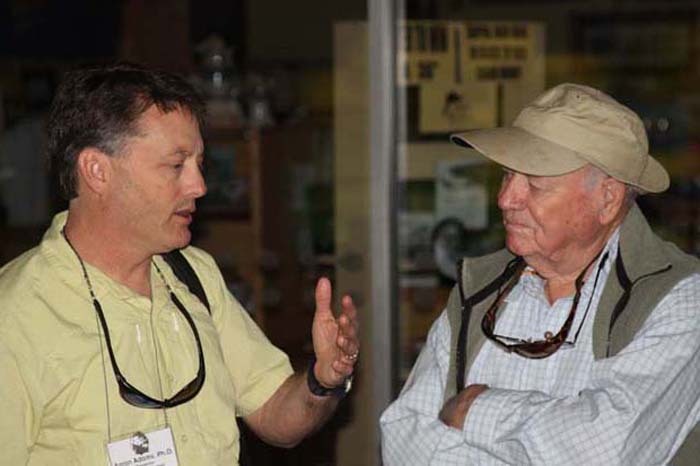 Aaron Adams, Bonefish & Tarpon Trust, asks Lefty about a pressing conservation issue at the 2011 BTT Symposium. Skip Clement photo. His granddaughter Sammantha Aus said the cause was congestive heart failure. For a half century, Mr. Kreh, a globe-trotting fisherman, journalist and author, was a colorful and highly influential figure in both freshwater and saltwater fly-fishing. In countless articles and more than 30 books, in videos, on television and at innumerable public appearances, he converted his vast experience into lucid observations and practical advice for anglers at all levels. Lefty Kreh’s Florida Keys invention – the Deciever. 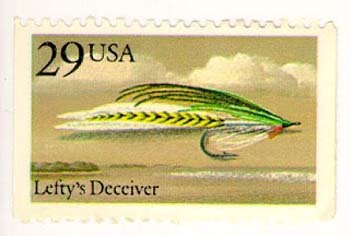 A 1991 U. S.postal stamp. While fly angling in fresh water for fish like trout and salmon is an old sport, saltwater fly-fishing is comparatively new, and Mr. Kreh was one of its earliest champions. His book “Fly Fishing in Salt Water,” which he said he wrote “not to make money, but so I didn’t have to answer so many darn questions,” was published in 1974 and remains an essential text. . . .
. . . In 1947, back in Maryland, where he had gained some renown as an expert in fishing smallmouth bass, he came to the attention of Joe Brooks, an outdoor writer a generation older than Mr. Kreh.